Sooke's fishing continues to be hot and cold....though probably more on the warm side! There are reports of some slow days and then there are some REALLY BIG salmon being caught. The latest is a 51 pound slab caught off Possession Point in Sooke by Dewayne Walsh (photo from Island Outfitters report). The Bite Me Salmon Fishing Derby had some very respectable fish too over the two days. 106 salmon were weighed in on Saturday and 44 weighed in Sunday. 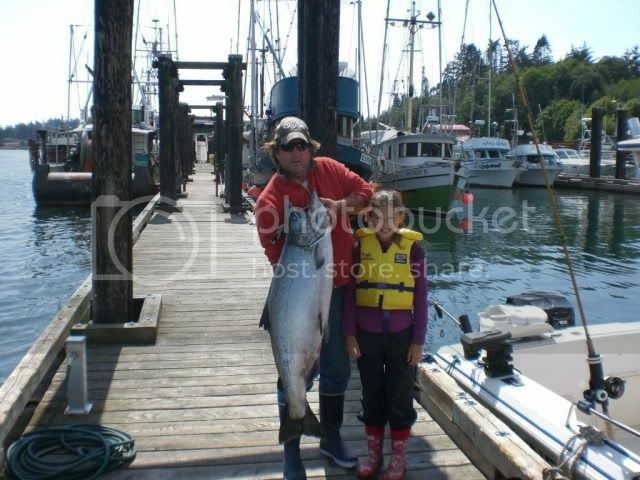 The winner was a 42.7 lbs Chinook Salmon caught by Keith Martin. Ryan from Fresh Fishing Charters posted the following report: "Since thursday nite i've been hitting a good one every time out. I've been very aggressive with the reefs at Otter Point by staying close to the bottom when cruising over them, in tight to shore. 75 feet off first rock...50 ft from 1st to 3rd...had luck in both spots. Got a couple of hogs at Possession Point too...good luck out there."